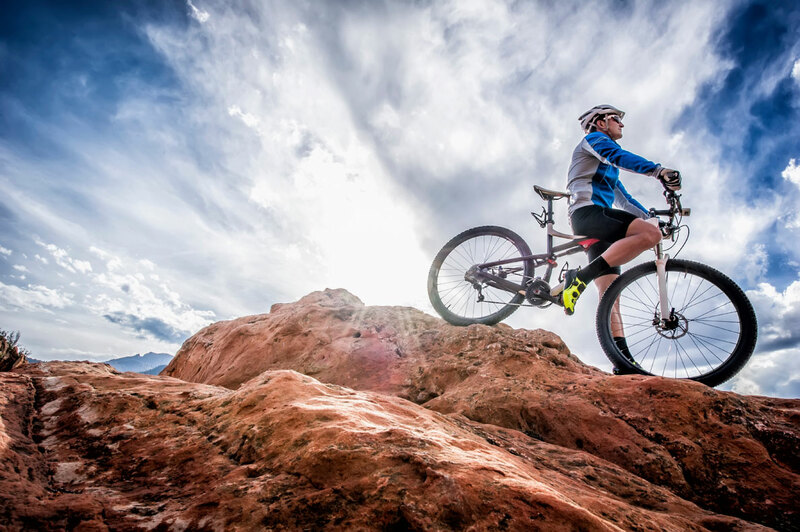 Mountain biking is all about being out there, free to explore the natural terrain—but it also requires more technical skill than any other form of riding. Nobody knows that better than Rebecca Rusch, a tough-as-nails pro mountain biker who’s garnered seven national mountain biking titles in addition to winning the legendary Leadville 100 four times. “Technical riding has never been my strong point,” Rusch says. “I’ve definitely had to put in my time to up my game.” She recommends you do the same—and concentrate on your weaknesses—if you want to access more trails and have more fun in the saddle. There’s nothing better for mastering skills than repetition, Rusch says, and a good bike park with chairlift access and purposebuilt mountain trails is the ultimate, allowing for tons of practice in a given day. You can choose from different levels of terrain and progress as you become comfortable. Pump tracks—small roller- and berm-filled playgrounds—are the best place to learn cornering and body position over the bike. They’re meant to be ridden without pedaling, instead using body English to work the bike and your body around the track. They can also be chances to learn from the best: Riding behind someone who’s better than you gives you the opportunity to mimic their body position and line choice before you even really know what you’re doing. It’s learning by example at its very best. A tense body magnifies all of the bumps on the trail and bounces you around. Relax your arms, knees, face— everything. You may have to consciously remind yourself to do it before tough sections, since your body might automatically tense up as you approach them. 2) Put your natural suspension to work. Your best suspension is the one you were born with—your arms and legs. They should be bent at all times and moving up and down to absorb the bumps and chatter of roots and ruts. Avoid muscle fatigue by loosening your handlebar death grip and making “pushup arms”: elbows out and bent, similar to the pushup position. 3) Let your bike and body move separately. Except for your hands and feet, your body should be open and away from the bike to allow it to float, lean, and move beneath you when the trail gets rough. This is essential in rock gardens and tight corners. 4) Let your body point the way. Rusch aims her knees where she wants to go, and her hips and body follow, letting her steer more naturally. Don’t overthink it, she says. 5) Brake before obstacles, not in the middle of them. Speed and momentum are your friends: Momentum irons out the bumps in the road, and speed makes the bike more stable. Try to evaluate an obstacle before you reach it, and look for good braking on either side. Once you commit, let off the brakes and float on through until you’re clear. Brake again on the other side.